I have never been a fan of regular potato salad for one reason. I feel like it should be warm. I hate eating those cold potatoes. This Loaded Baked Potato Salad is my PERFECT solution. I have made it a few times and I love it. You can serve it warm or you can serve it cold. Obviously, I serve mine warm which isn't a problem, since I make it right before dinner. I haven't served this at a party yet, but I would imagine you would get multiple requests for the recipe. I think your family would be super impressed and, like Leslie said, I am sure you will get "Oohs and Ahhs"! Wash, peel and cube potatoes into bite-sized pieces. Put in a large pot, cover with water and boil until fork tender, about 15-20 minutes. You do not want mashed potato consistency. Drain and let cool a bit (or a lot if you plan to serve chilled). In a separate bowl, stir together the mayo, sour cream, cheese, half the chives, about 6 strips worth of crumbled bacon, seasoned salt and pepper; mix well. Add mixture to potatoes and fold together until all the potatoes are completely coated. Taste and add more seasoned salt and pepper, if needed. Garnish with remaining chives and crumbled bacon. Serve immediately or refrigerate if serving later. Serves 4-6. Jenn's Notes: If your potatoes are very large, you may want to add a little extra mayo and sour cream. I have used light mayo and light sour cream every time I have made this, I omit the chives and sprinkle with a little dried parsley before serving. So good! 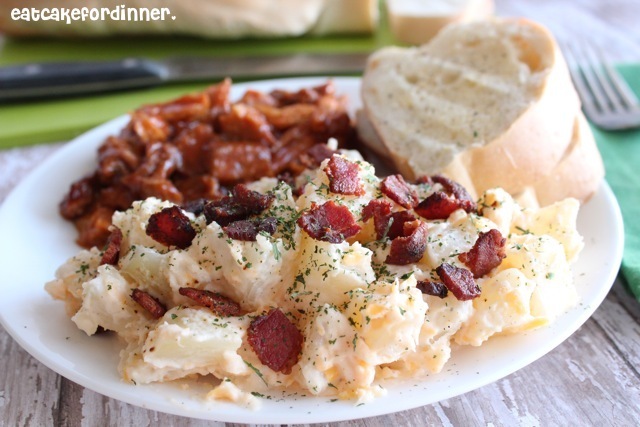 I love how you put bacon in potato salad! Such a great idea! My mom always made warm mashed potato salad, and oh how I loved it. This sounds delicious. This looks great! New follower from Financial Friday. Oh my goodness...this looks AMAZING! Thanks for the Loaded Baked Potato Salad recipe. If you don't mind, can you submit your Loaded Baked Potato Salad photo in http://www.foodporn.net ? Made this today with chopped up left over baked potatoes from last night...YUM!!! Do you think I could omit the mayo and use a mix of plain yogurt and sour cream instead? Thanks for the recipe by the way, it sounds delicious, and I have just the event for it. Hmmm . . . I have used plain yogurt in the place of sour cream in other recipes and it has worked great, but I'm not sure about the Mayo. It might be too tangy with both yogurt and sour cream, but if you have subbed yogurt for Mayo before and liked the flavor, then I think it would be just fine. You could always just try a small batch with the yogurt and sour cream before mixing it into the whole thing? If you try it and it works, let me know.